1082 results. Displaying results 81 - 100. 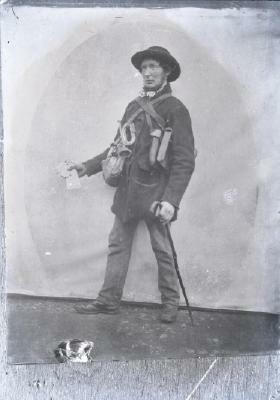 Glass plate negative of Henley's first postman standing in front of a wall with small bags over his shoulders and holding a walking stick. A George Bushell Collection (Part of negative set number 146 in George Bushell's notebook] George Bushell came to Henley in 1919 and took over the task of taking photographs of Henley and its surroundings from two predecessors, called Marsh and Marshall. Bushell died in the 1960s but his business was carried on by his son and grandson. It is his grandson, also called George Bushell, who has donated this important collection of photographs and glass plate negatives to the Museum. This unique collection provides a fascinating view of the changing face of Henley and the Thames over the last century. Glass plate negative of the tomb at Greys Church at an angle. 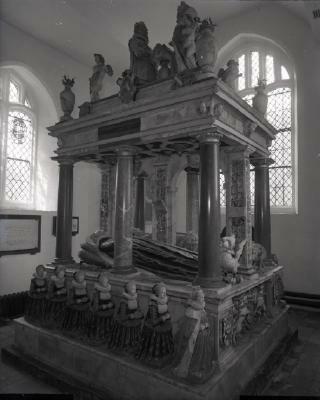 It is a large monument with pillars and statues on the top and round the edge with a figure lying on pillows in the middle. The tomb is the resting place of Francis and Katherine Knollys. A George Bushell Collection (Part of negative set number 147 in George Bushell's notebook] George Bushell came to Henley in 1919 and took over the task of taking photographs of Henley and its surroundings from two predecessors, called Marsh and Marshall. Bushell died in the 1960s but his business was carried on by his son and grandson. It is his grandson, also called George Bushell, who has donated this important collection of photographs and glass plate negatives to the Museum. This unique collection provides a fascinating view of the changing face of Henley and the Thames over the last century. Negative of the figures on the tomb at Greys Church. 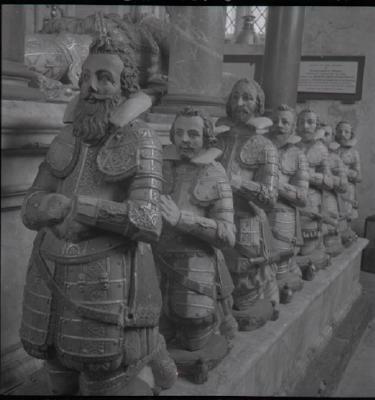 There are seven men in armour kneeling down facing to the right of the tomb The tomb is the resting place of Francis and Katherine Knollys. A George Bushell Collection (Part of negative set number 151 in George Bushell's notebook] George Bushell came to Henley in 1919 and took over the task of taking photographs of Henley and its surroundings from two predecessors, called Marsh and Marshall. Bushell died in the 1960s but his business was carried on by his son and grandson. It is his grandson, also called George Bushell, who has donated this important collection of photographs and glass plate negatives to the Museum. This unique collection provides a fascinating view of the changing face of Henley and the Thames over the last century. 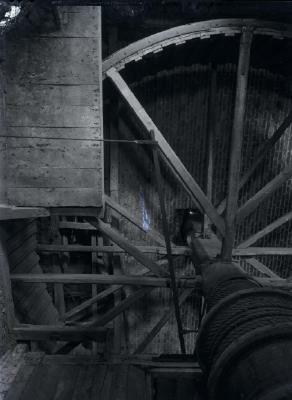 Negative of the donkey wheel at Greys House, which is a large wooden spoked wheel with ridges on the inside of the cylinder for the donkey to 'grip' the wheel. The wheel was turned by the donkey to raise the water level in a well. A George Bushell Collection (Part of negative set number 152 in George Bushell's notebook] George Bushell came to Henley in 1919 and took over the task of taking photographs of Henley and its surroundings from two predecessors, called Marsh and Marshall. Bushell died in the 1960s but his business was carried on by his son and grandson. It is his grandson, also called George Bushell, who has donated this important collection of photographs and glass plate negatives to the Museum. This unique collection provides a fascinating view of the changing face of Henley and the Thames over the last century. 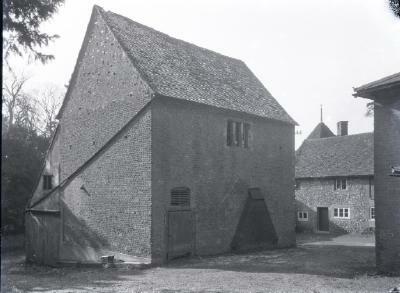 Negative of the donkey wheel building at Greys House, which is an unusual shaped building, it is built on a slant and has a second section at the back to correct this. The wheel was turned by the donkey to raise the water level in a well. A George Bushell Collection (Part of negative set number 153 in George Bushell's notebook] George Bushell came to Henley in 1919 and took over the task of taking photographs of Henley and its surroundings from two predecessors, called Marsh and Marshall. Bushell died in the 1960s but his business was carried on by his son and grandson. It is his grandson, also called George Bushell, who has donated this important collection of photographs and glass plate negatives to the Museum. This unique collection provides a fascinating view of the changing face of Henley and the Thames over the last century. Glass plate negative of the Henley fire station receiving their new engine. In the image is the front of the engine with the fire officers and the public looking on. A George Bushell Collection (Part of negative set number 155b in George Bushell's notebook] George Bushell came to Henley in 1919 and took over the task of taking photographs of Henley and its surroundings from two predecessors, called Marsh and Marshall. Bushell died in the 1960s but his business was carried on by his son and grandson. It is his grandson, also called George Bushell, who has donated this important collection of photographs and glass plate negatives to the Museum. This unique collection provides a fascinating view of the changing face of Henley and the Thames over the last century. 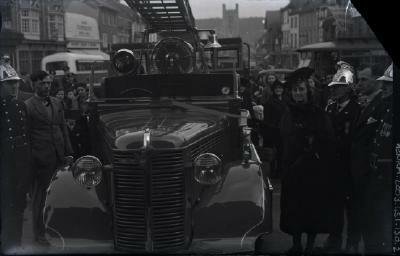 Glass plate negative of the Henley fire station receiving their new engine. 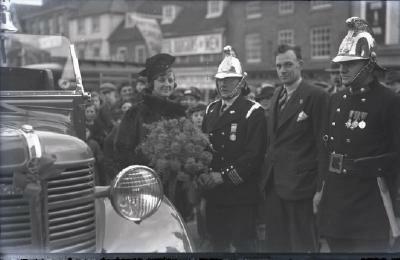 In the image is the front of the engine with a woman holding flowers and fire officers looking on. A George Bushell Collection (Part of negative set number 155c in George Bushell's notebook] George Bushell came to Henley in 1919 and took over the task of taking photographs of Henley and its surroundings from two predecessors, called Marsh and Marshall. Bushell died in the 1960s but his business was carried on by his son and grandson. It is his grandson, also called George Bushell, who has donated this important collection of photographs and glass plate negatives to the Museum. This unique collection provides a fascinating view of the changing face of Henley and the Thames over the last century. 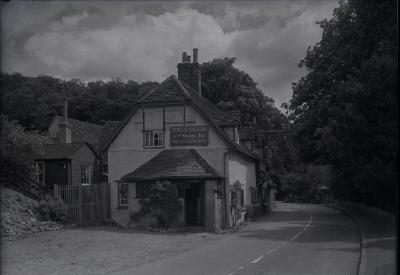 Glass plate negative of the Dog and Badger Public House in Medmenham, a small country pub on a quiet lane surrounded by tall trees. A George Bushell Collection (Part of negative set number 157 in George Bushell's notebook] George Bushell came to Henley in 1919 and took over the task of taking photographs of Henley and its surroundings from two predecessors, called Marsh and Marshall. Bushell died in the 1960s but his business was carried on by his son and grandson. It is his grandson, also called George Bushell, who has donated this important collection of photographs and glass plate negatives to the Museum. This unique collection provides a fascinating view of the changing face of Henley and the Thames over the last century. 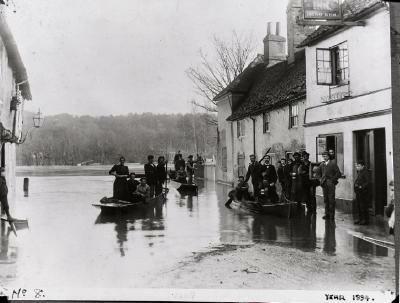 Negative of Friday Street, Henley on Thames, in flood. (Part of negative set number 5 in George Bushell's notebook) George Bushell came to Henley in 1919 and took over the task of taking photographs of Henley and its surroundings from two predecessors, called Marsh and Marshall. Bushell died in the 1960s but his business was carried on by his son and grandson. It is his grandson, also called George Bushell, who has donated this important collection of photographs and glass plate negatives to the Museum. This unique collection provides a fascinating view of the changing face of Henley and the Thames over the last century. 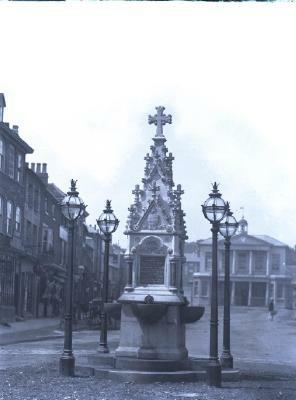 Glass plate negative of the Philimore Fountain, Henley on Thames. (Part of negative set number 9 in George Bushell's notebook) George Bushell came to Henley in 1919 and took over the task of taking photographs of Henley and its surroundings from two predecessors, called Marsh and Marshall. Bushell died in the 1960s but his business was carried on by his son and grandson. It is his grandson, also called George Bushell, who has donated this important collection of photographs and glass plate negatives to the Museum. This unique collection provides a fascinating view of the changing face of Henley and the Thames over the last century.